buildOn’s Service Learning Programs in Bridgeport engage high school students in service and empower them to tackle the community issues that matter most to them. Though graduation rates are comparatively better than those of other inner-city areas, one in five Bridgeport freshmen are expected to drop out before they graduate. 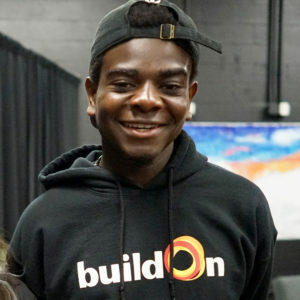 buildOn runs Service Learning Programs at two Bridgeport High Schools, where students regularly volunteer to serve meals at shelters for homeless and returning veterans, tutor and mentor elementary school students, and organize food and clothing drives for those in need in their Bridgeport community. Spending quality time with seniors is just one of the ways buildOn students spread compassion in Bridgeport. In Bridgeport, buildOn students are serving where help is needed, like community clothing giveaways. buildOn students in Bridgeport are greening their communities while mentoring younger children. Meet some of the Bridgeport students we're empowering to serve. news, student success stories, events and more. buildOn provides a variety fully immersive experiences that allow your organization to mentor and serve with Bridgeport youth, share your skills, and make a positive impact in your community. Your donation can help a Bridgeport student become a leader in his urban community. A gift of just $36 provides a Bridgeport student with a week of impactful buildOn Service Learning Programs.